This British surname is barrelled, being made up of multiple names. It should be written as Lloyd Webber, not Webber. Olivier Awards (8, 1978–2018, incl. Andrew Lloyd Webber, Baron Lloyd-Webber (born 22 March 1948) is an English composer and impresario of musical theatre. Several of his musicals have run for more than a decade both in the West End and on Broadway. He has composed 13 musicals, a song cycle, a set of variations, two film scores, and a Latin Requiem Mass. Several of his songs have been widely recorded and were hits outside of their parent musicals, notably "The Music of the Night" and "All I Ask of You" from The Phantom of the Opera, "I Don't Know How to Love Him" from Jesus Christ Superstar, "Don't Cry for Me, Argentina" from Evita, "Any Dream Will Do" from Joseph and the Amazing Technicolor Dreamcoat, and "Memory" from Cats. In 2001 The New York Times referred to him as "the most commercially successful composer in history". Ranked the "fifth most powerful person in British culture" by The Daily Telegraph in 2008, the lyricist Don Black stated "Andrew more or less single-handedly reinvented the musical." He has received a number of awards, including a knighthood in 1992, followed by a peerage from Queen Elizabeth II for services to Music, six Tonys, three Grammys (as well as the Grammy Legend Award), an Academy Award, fourteen Ivor Novello Awards, seven Olivier Awards, a Golden Globe, a Brit Award, the 2006 Kennedy Center Honors, and the 2008 Classic Brit Award for Outstanding Contribution to Music. He has a star on the Hollywood Walk of Fame, is an inductee into the Songwriter's Hall of Fame, and is a fellow of the British Academy of Songwriters, Composers and Authors. He is one of only fifteen people to have won an Emmy, Oscar, Grammy and Tony. His company, the Really Useful Group, is one of the largest theatre operators in London. Producers in several parts of the UK have staged productions, including national tours, of the Lloyd Webber musicals under licence from the Really Useful Group. Lloyd Webber is also the president of the Arts Educational Schools London, a performing arts school located in Chiswick, West London. He is involved in a number of charitable activities, including the Elton John AIDS Foundation, Nordoff Robbins, Prostate Cancer UK and War Child. In 1992 he set up the Andrew Lloyd Webber Foundation which supports the arts, culture and heritage in the UK. Andrew Lloyd Webber was born in Kensington, London, the elder son of William Lloyd Webber (1914–1982), a composer and organist, and Jean Hermione Johnstone (1921–1993), a violinist and pianist. His younger brother, Julian Lloyd Webber, has had a notable career as a solo cellist. Lloyd Webber started writing his own music at a young age, a suite of six pieces at the age of nine. He also put on "productions" with Julian and his Aunt Viola in his toy theatre (which he built at Viola's suggestion). His aunt Viola, an actress, took him to see many of her shows and through the stage door into the world of the theatre. He also had originally set music to Old Possum's Book of Practical Cats at the age of 15. In 1965, Lloyd Webber was a Queen's Scholar at Westminster School and studied history for a term at Magdalen College, Oxford, although he abandoned the course in the winter of 1965 to study at the Royal College of Music and pursue his interest in musical theatre. In 1965, when Lloyd Webber was a 17-year-old budding musical-theatre composer, he was introduced to the 20-year-old aspiring pop-song writer Tim Rice. Their first collaboration was The Likes of Us, a musical based on the true story of Thomas John Barnardo. They produced a demo tape of that work in 1966, but the project failed to gain a backer. Although composed in 1965, The Likes of Us was not publicly performed until 2005, when a production was staged at Lloyd Webber's Sydmonton Festival. In 2008, amateur rights were released by the National Operatic and Dramatic Association (NODA) in association with the Really Useful Group. The first amateur performance was by a children's theatre group in Cornwall called "Kidz R Us". Stylistically, The Likes of Us is fashioned after the Broadway musical of the 1940s and 1950s; it opens with a traditional overture comprising a medley of tunes from the show, and the score reflects some of Lloyd Webber's early influences, particularly Richard Rodgers, Frederick Loewe, and Lionel Bart. In this respect, it is markedly different from the composer's later work, which tends to be either predominantly or wholly through-composed, and closer in form to opera than to the Broadway musical. In the summer of 1967 Alan Doggett, a family friend of the Lloyd Webbers who had assisted on The Likes of Us and who was the music teacher at the Colet Court school in London, commissioned Lloyd Webber and Rice to write a piece for the school's choir. Doggett requested a "pop cantata" along the lines of Herbert Chappell's The Daniel Jazz (1963) and Michael Hurd's Jonah-Man Jazz (1966), both of which had been published by Novello and were based on the Old Testament. The request for the new piece came with a 100-guinea advance from Novello. This resulted in Joseph and the Amazing Technicolor Dreamcoat, a retelling of the biblical story of Joseph, in which Lloyd Webber and Rice humorously pastiched a number of pop-music styles such as Elvis-style rock'n'roll, Calypso and country music. Joseph began life as a short cantata that gained some recognition on its second staging with a favourable review in The Times. For its subsequent performances, Rice and Lloyd Webber revised the show and added new songs to expand it to a more substantial length. Continued expansion eventually culminated in a 1972 stage musical and then a two-hour-long production being staged in the West End in 1973 on the back of the success of Jesus Christ Superstar. In 1969, Rice and Lloyd Webber wrote a song for the Eurovision Song Contest called "Try It and See", which was not selected. With rewritten lyrics it became "King Herod's Song" in their third musical, Jesus Christ Superstar (1970). The planned follow-up to Jesus Christ Superstar was a musical comedy based on the Jeeves and Wooster novels by P. G. Wodehouse. Tim Rice was uncertain about this venture, partly because of his concern that he might not be able to do justice to the novels that he and Lloyd Webber so admired. After doing some initial work on the lyrics, he pulled out of the project[when?] and Lloyd Webber subsequently wrote the musical Jeeves with Alan Ayckbourn, who provided the book and lyrics. Jeeves failed to make any impact at the box office and closed after a run of only three weeks in 1975. Many years later, Lloyd Webber and Ayckbourn revisited this project, producing a thoroughly reworked and more successful version entitled By Jeeves (1996). Only two of the songs from the original production remained ("Half a Moment" and "Banjo Boy"). Lloyd Webber collaborated with Rice once again to write Evita (1978 in London/1979 in U.S.), a musical based on the life of Eva Perón. As with Jesus Christ Superstar, Evita was released first as a concept album (1976) and featured Julie Covington singing the part of Eva Perón. The song "Don't Cry for Me Argentina" became a hit single and the musical was staged at the Prince Edward Theatre in a production directed by Harold Prince and starring Elaine Paige in the title role. Patti LuPone created the role of Eva on Broadway for which she won a Tony. Evita was a highly successful show that ran for ten years in the West End. It transferred to Broadway in 1979. Rice and Lloyd Webber parted ways soon after Evita. In an interview in 2011, LuPone commented, "He writes crap music... Evita was his best score, Evita in its bizarreness - when I first heard it I thought 'I swear to God, he hated women' [...] There are some very romantic moments in his music, and there is some real...trash that he doesn't even think about parting with. He's not a very good editor of his own stuff." In 1978, Lloyd Webber embarked on a solo project, the Variations, with his cellist brother Julian based on the 24th Caprice by Paganini, which reached number two in the pop album chart in the United Kingdom. The main theme was used as the theme tune for ITV's long-running South Bank Show throughout its 32-year run. The same year, Lloyd Webber also composed a new theme tune for the long-running documentary series Whicker's World, which was used from 1978 to 1980. Lloyd Webber was the subject of This Is Your Life in November 1980 when he was surprised by Eamonn Andrews in the foyer of Thames Television's Euston Road Studios. He would be honoured a second time by the television programme in November 1994 when Michael Aspel surprised him at the Adelphi Theatre. Lloyd Webber embarked on his next project without a lyricist, turning instead to the poetry of T. S. Eliot. Cats (1981) was to become the longest running musical in London, where it ran for 21 years before closing. On Broadway, Cats ran for 18 years, a record which would ultimately be broken by another Lloyd Webber musical, The Phantom of the Opera. Starlight Express (1984) was a commercial hit, but received negative reviews from the critics. It enjoyed a record run in the West End, but ran for less than two years on Broadway. The show has also seen two tours of the US, as well as an Australian/Japanese production, a three-year UK touring production, which transferred to New Zealand later in 2009. The show also runs full-time in a custom-built theatre in Bochum, Germany, where it has been running since 1988. Lloyd Webber wrote a Requiem Mass dedicated to his father, William, who had died in 1982. It premiered at St. Thomas Church in New York on 24 February 1985. Church music had been a part of the composer's upbringing and the composition was inspired by an article he had read about the plight of Cambodian orphans. Lloyd Webber had on a number of occasions written sacred music for the annual Sydmonton Festival. Lloyd Webber received a Grammy Award in 1986 for Requiem in the category of best classical composition. Pie Jesu from Requiem achieved a high placing on the UK pop charts. Perhaps because of its large orchestration, live performances of the Requiem are rare. Cricket (1986), also called Cricket (Hearts and Wickets), reunited Lloyd Webber with Tim Rice to create this short musical for Queen Elizabeth's 60th birthday, first performed at Windsor Castle. Several of the tunes were later used for Aspects of Love and Sunset Boulevard. Lloyd Webber also premiered The Phantom of the Opera in 1986, inspired by the 1911 Gaston Leroux novel. He wrote the part of Christine for his then-wife, Sarah Brightman, who played the role in the original London and Broadway productions alongside Michael Crawford as the Phantom. The production was directed by Harold Prince, who had also earlier directed Evita. Charles Hart wrote the lyrics for Phantom with some additional material provided by Richard Stilgoe, with whom Lloyd Webber co-wrote the book of the musical. It became a hit and is still running in both the West End and on Broadway; in January 2006 it overtook Cats as the longest-running musical on Broadway. On 11 February 2012, Phantom of the Opera played its 10,000th show on Broadway. Aspects of Love followed in 1989, a musical based on the story by David Garnett. The lyrics were by Don Black and Charles Hart and the original production was directed by Trevor Nunn. Aspects had a run of four years in London, but closed after less than a year on Broadway. It has since gone on a tour of the UK. Lloyd Webber was asked to write a song for the 1992 Barcelona Olympics and composed "Amigos Para Siempre — Friends for Life" with Don Black providing the lyrics. This song was performed by Sarah Brightman and José Carreras. Lloyd Webber had toyed with the idea of writing a musical based on Billy Wilder's critically acclaimed movie, Sunset Boulevard, since the early 1970s when he saw the film, but the project didn't come to fruition until after the completion of Aspects of Love when the composer finally managed to secure the rights from Paramount Pictures, The composer worked with two collaborators, as he had done on Aspects of Love; this time Christopher Hampton and Don Black shared equal credit for the book and lyrics. The show opened at the Adelphi Theatre in London on 12 July 1993, and ran for 1,529 performances. In spite of the show's popularity and extensive run in London's West End, it lost money due to the sheer expense of the production. In 1994, Sunset Boulevard became a successful Broadway show, opening with the largest advance in Broadway history, and winning seven Tony Awards that year. Even so, by its closing in 1997, "it had not recouped its reported $13 million investment." From 1995-2000, Lloyd Webber wrote the Matters of Taste column in The Daily Telegraph where he reviewed restaurants and hotels, and these were illustrated by Lucinda Rogers. In 1998, Lloyd Webber released a film version of Cats, which was filmed at the Adelphi Theatre in London. David Mallet directed the film, and Gillian Lynne choreographed it. The cast consisted of performers who had been in the show before, including Ken Page (the original Old Deuteronomy on Broadway), Elaine Paige (original Grizabella in London) and Sir John Mills as Gus: the Theatre Cat. In 1998, Whistle Down the Wind made its debut, a musical written with lyrics supplied by Jim Steinman. Originally opening in Washington, Lloyd Webber was reportedly not happy with the casting or Harold Prince's production and the show was subsequently revised for a London staging directed by Gale Edwards. The production included the Boyzone number-one hit "No Matter What", which only left the UK charts when the price of the CD single was changed to drop it out of the official top ten. His The Beautiful Game opened in London and has never been seen on Broadway. The show had a respectable run at The Cambridge Theatre in London. The show has been re-worked into a new musical, The Boys in the Photograph, which had its world première at The Liverpool Institute for Performing Arts in April 2008. Having achieved great popular success in musical theatre, Lloyd Webber was referred to by The New York Times in 2001 as "the most commercially successful composer in history." In 2002 he turned producer, bringing the musical Bombay Dreams to London. With music by Indian Music composer A.R. Rahman and lyrics by Don Black, it ran for two years at the Apollo Victoria Theatre. A revised Broadway production at the Broadway Theatre two years later ran for only 284 performances. On 16 September 2004, his production of The Woman in White opened at the Palace Theatre in London. It ran for 19 months and 500 performances. A revised production opened on Broadway at the Marquis Theatre on 17 November 2005. Garnering mixed reviews from critics, due in part to the frequent absences of the show's star Maria Friedman due to breast cancer treatment, it closed only a brief three months later on 19 February 2006. Lloyd Webber produced a staging of The Sound of Music, which débuted November 2006. He made the controversial decision to choose an unknown to play leading lady Maria, who was found through the BBC's reality television show How Do You Solve a Problem like Maria?, in which he was a judge. The winner of the show was Connie Fisher. It was announced on 25 August 2006, on his personal website, that his next project would be The Master and Margarita; however, it was announced in late March 2007 that he had abandoned the project. U.S. President George W. Bush and First Lady Laura Bush stand with the Kennedy Center honourees in the Blue Room of the White House during a reception Sunday, 3 December 2006. 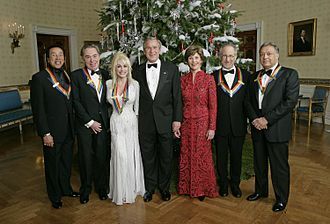 From left, they are: singer and songwriter William "Smokey" Robinson; Andrew Lloyd Webber; country singer Dolly Parton; film director Steven Spielberg; and conductor Zubin Mehta. In September 2006, Lloyd Webber was named to be a recipient of the prestigious Kennedy Center Honors with Zubin Mehta, Dolly Parton, Steven Spielberg, and Smokey Robinson. He was recognised for his outstanding contribution to American performing arts. He attended the ceremony on 3 December 2006; it aired on 26 December 2006. On 11 February 2007, Lloyd Webber was featured as a guest judge on the reality television show Grease: You're the One that I Want! The contestants all sang "The Phantom of the Opera". Between April and June 2007, he appeared in BBC One's Any Dream Will Do!, which followed the same format as How Do You Solve a Problem Like Maria?. Its aim was to find a new Joseph for his revival of Joseph and the Amazing Technicolor Dreamcoat. Lee Mead won the contest after quitting his part in the ensemble – and as understudy in The Phantom of the Opera – to compete for the role. Viewers' telephone voting during the series raised more than £500,000 for the BBC's annual Children in Need charity appeal, according to host Graham Norton on air during the final. In 2007, Lloyd Webber's cat, Otto, leaped onto his Clavinova piano and "destroyed the entire score for the new 'Phantom' in one fell swoop." The Phantom in question was The Phantom of Manhattan, a planned sequel to Phantom of the Opera. On 1 July 2007, Lloyd Webber presented excerpts from his musicals as part of the Concert for Diana held at Wembley Stadium, London, an event organised to celebrate the life of Princess Diana almost 10 years after her death. BBC Radio 2 broadcast a concert of music from the Lloyd Webber musicals on 24 August 2007. Denise Van Outen introduced songs from Whistle Down the Wind, The Beautiful Game, Tell Me on a Sunday, The Woman in White, Evita and Joseph and the Amazing Technicolor Dreamcoat – as well as Rodgers and Hammerstein's The Sound of Music, which Lloyd Webber revived in 2006 at the London Palladium, and the 2002 musical Bombay Dreams. In April 2008, Lloyd Webber reprised his role as judge, this time in the BBC musical talent show I'd Do Anything. The show followed a similar format to its Maria and Joseph predecessors, this time involving a search for an actress to play the role of Nancy in an upcoming West End production of the Lionel Bart musical Oliver! The show also featured a search for three young actors to play and share the title character's role, but the show's main focus was on the search for Nancy. The role was won by Jodie Prenger despite Lloyd Webber's stated preference for one of the other contestants; the winners of the Oliver role were Harry Stott, Gwion Wyn-Jones and Laurence Jeffcoate. Also in April 2008. Lloyd Webber was featured on the U.S. talent show American Idol, acting as a mentor when the 6 finalists had to select one of his songs to perform for the judges that week. Lloyd Webber accepted the challenge of managing the UK's entry for the 2009 Eurovision Song Contest, to be held in Moscow. In early 2009 a series, called Eurovision: Your Country Needs You, was broadcast to find a performer for a song that he would compose for the competition. Jade Ewen won the right to represent Britain, winning with It's My Time, by Lloyd Webber and Diane Warren. At the contest, Lloyd Webber accompanied her on the piano during the performance. The United Kingdom finished 5th in the contest. The winner was Norway's Alexander Rybak with his composition "Fairytale". On 8 October 2009, Lloyd Webber launched the musical Love Never Dies at a press conference held at Her Majesty's Theatre, where the original Phantom has been running since 1986. Also present were Sierra Boggess, who had been cast as Christine Daaé, and Ramin Karimloo, who portrayed Phantom, a role he had recently played in the West End. Following the opening of Love Never Dies, Lloyd Webber again began a search for a new musical theatre performer in the BBC One series Over the Rainbow. He cast the winner, Danielle Hope, in the role of Dorothy, and a dog to play Toto in his forthcoming stage production of The Wizard of Oz. He and lyricist and composer Tim Rice wrote a number of new songs for the production to supplement the songs from the film. On 1 March 2011, The Wizard of Oz opened at The Palladium Theatre, starring Danielle Hope as Dorothy and Michael Crawford as the Wizard. In 2012, Lloyd Webber fronted a new ITV primetime show Superstar which gave the UK public the chance to decide who would play the starring role of Jesus in an upcoming arena tour of Jesus Christ Superstar. The arena tour started in September 2012 and also starred comedian Tim Minchin as Judas Iscariot, former Spice Girl Melanie C as Mary Magdalene and BBC Radio 1 DJ Chris Moyles as King Herod. Tickets for most venues went on sale on 18 May 2012. Lloyd Webber created media attention with a series of comments about Eurovision in a Radio Times interview. [clarification needed] He said: "I don't think there's any point in beating around the bush. I saw no black faces on the programme Eurovision 2012. I was questioned by the press over Jade Ewen's race, and I think we would have placed second, but there is a problem when you go further east. If you're talking about Western Europe it's fine, but Ukraine, not so good. "[clarification needed] The EBU denied racism in its show, telling Lloyd Webber that Ukraine's singer Gaitana was black, that year's winner Loreen for Sweden was of North African background and accompanied by a black backing dancer, and France's contestant Anggun was Indonesian. The contest organisers also told Webber that black singer Dave Benton won for Estonia in 2001. The EBU said it unites Europe for three nights in a year. In 2013, Lloyd Webber reunited with Christopher Hampton and Don Black on Stephen Ward the Musical. In 2014, it was announced that Webber's next project would be a musical adaptation of the 2003 film School of Rock. On 19 January 2015 auditions opened for children aged nine to fifteen in cooperation with the School of Rock music education program, which predated the film by several years. Lloyd Webber's memoir, Unmasked, was published in March 2018. On 9 September 2018, Webber, along with Tim Rice and John Legend each won an Emmy for Jesus Christ Superstar Live in Concert. With this win, Webber, Rice and Legend joined the list of people who have won Academy, Emmy, Grammy, and Tony Awards. Lloyd Webber has been accused of plagiarism in his works. The Dutch composer Louis Andriessen commented that: "Andrew Lloyd Webber has yet to think up a single note; in fact, the poor guy's never invented one note by himself. That's rather poor". ...brings a new dramatic tension to Mendelssohn's original melody through the confused emotions of Mary Magdalene. The opening theme may be Mendelssohn, but the rhythmic and harmonic treatment along with new lines of highly effective melodic development are Lloyd Webber's. The song works in its own right as its many performers and audiences can witness. The songwriter Ray Repp claimed in a court case that Lloyd Webber had stolen a melody from his own song "Till You", but the court ruled in Lloyd Webber's favour. There was another accusation of plagiarism regarding Pink Floyd. The band released their sixth studio album, Meddle, in 1971, and the sixth track of the album, "Echoes", has a riff on which Lloyd Webber allegedly based the opening organ riff in "The Phantom of the Opera". The two riffs share very similar notes and the order of the notes played. Lloyd Webber's pipe organ riff from "Phantom of the Opera" plays D, C#, C, B, A#, then ascending A#, B, C, C#, D. Pink Floyd's "Echoes" plays C#, C, B, A#, A, then ascending A, A#, B, C, C#. Pink Floyd bassist and co-lead vocalist Roger Waters pointed this out and said it was "probably actionable", but stated he did not care to take it to court. Due to similarities between Lloyd Webber's "The Music of the Night" and a recurring melody in Giacomo Puccini's 1910 opera, La fanciulla del West (The Girl of the Golden West), the Puccini estate filed a lawsuit[when?] against Webber, accusing him of plagiarism. An agreement was settled out of court and details were not released to the public. He then married singer Sarah Brightman on 22 March 1984 in Hampshire. He cast Brightman in the lead role in his musical The Phantom of the Opera, among other notable roles. They divorced on 3 January 1990. Isabella Aurora Lloyd Webber (born 30 April 1996). Lloyd Webber and his third wife Madeleine founded the Watership Down Stud in 1992. In 1996, they expanded their equestrian holdings by purchasing Kiltinan Castle Stud near Fethard in County Tipperary, Ireland. The Sunday Times Rich List 2006 ranked him the 87th-richest man in Britain with an estimated fortune of £700 million. His wealth increased to £750 million in 2007, but the publication ranked him 101st in 2008. He lives at Sydmonton Court, Hampshire, and owns much of nearby Watership Down. Lloyd Webber is an art collector, with a passion for Victorian painting. An exhibition of works from his collection was presented at the Royal Academy in 2003 under the title Pre-Raphaelite and Other Masters – The Andrew Lloyd Webber Collection. In 2006, Lloyd Webber planned to sell Portrait of Angel Fernández de Soto by Pablo Picasso to benefit the Andrew Lloyd Webber Foundation. In November 2006, he withdrew the painting from auction after a claim that the previous owner had been forced to sell it under duress in Nazi Germany. An out-of-court settlement was reached, where the foundation retained ownership rights. On 23 June 2010, the painting was sold at auction for £34.7 million to an anonymous telephone bidder. Lloyd Webber was made a Conservative life peer in 1997; however by the end of 2015, he had voted only 33 times. Politically, Lloyd Webber has supported the UK's Conservative Party, allowing his song "Take That Look Off Your Face" to be used on a party promotional film seen by an estimated 1 million people before the 2005 general election. In August 2014, Lloyd Webber was one of 200 public figures who were signatories to a letter to The Guardian opposing Scottish independence in the run-up to September's referendum on that issue. In October 2015, Lloyd Webber was involved in a contentious House of Lords vote over proposed cuts to tax credits, voting with the Government in favour of the plan. Lloyd Webber was denounced by his critics because he flew in from abroad on his personal plane to vote, when his voting record was scant. In October 2017, Webber retired from the House of Lords, stating that his busy schedule was incompatible with the demands of Parliament considering the upcoming crucial Brexit legislation. In late 2009, Lloyd Webber had surgery for early-stage prostate cancer, but had to be readmitted to hospital with post-operative infection in November. In January 2010, he declared he was cancer-free. He had his prostate completely removed as a preventative measure. Lloyd Webber was appointed Knight Bachelor in the 1992 Birthday Honours for services to the Arts. In the 1997 New Year Honours he was created a life peer as Baron Lloyd-Webber, of Sydmonton in the County of Hampshire. He is properly styled as The Lord Lloyd-Webber; the title is hyphenated, although his surname is not. He sat as a Conservative member of the House of Lords until his retirement from the House on 17 October 2017. One nomination for Best Original Song: "Learn to Be Lonely" from the 2004 motion picture The Phantom of the Opera . Plus one nomination for Best Original Song: "Learn to Be Lonely" from the 2004 motion picture The Phantom of the Opera. 2009 - American Theatre Hall of Fame. Note: Music composed by Andrew Lloyd Webber unless otherwise noted. Inspired by the Thomas the Tank Engine and Friends books by The Rev. W. Awdry. There have been a number of film adaptations of the Lloyd Webber musicals. Jesus Christ Superstar (1973) was directed by Norman Jewison; Evita (1996) was directed by Alan Parker; and The Phantom of the Opera (2004) was directed by Joel Schumacher and co-produced by Lloyd Webber. Cats, Joseph and the Amazing Technicolor Dreamcoat, Jesus Christ Superstar and By Jeeves have been adapted into made-for-television films that have been released on DVD and VHS and often air on BBC. A special performance of The Phantom of the Opera at the Royal Albert Hall for the 25th anniversary was broadcast live to cinemas in early October 2011 and later released on DVD and Blu-ray in February 2012. The same was also done with a reworked version of Love Never Dies. Filmed in Melbourne, Australia, it received a limited cinema release in the US and Canada in 2012, to see if it would be viable to bring the show to Broadway. It received positive reviews[by whom?] and was No.1 on DVD charts in the UK and Ireland, and did well in America. The Odessa File (1974) – Film score. Variations (1978) – A set of musical variations on Niccolò Paganini's Caprice in A minor that Lloyd Webber composed for his brother, cellist Julian. This album featured fifteen rock musicians including guitarist Gary Moore and pianist Rod Argent and reached number 2 in the UK album chart upon its release. It was later combined with Tell Me on a Sunday to form one show, Song and Dance. Lloyd Webber also used variation five as the basis for Unexpected Song in Song and Dance. The main theme is used as the theme music to The South Bank Show. Requiem (1985) – A classical choral work composed in honour of his father, William. Watership Down (1999) - Lloyd Webber and Mike Batt, main soundtrack composer of the animated series adaptation of Richard Adams' novel of the same name, composed the song "Fields of Sun". The actual song was never used on the show, nor was it available on the CD soundtrack that was released at the time. He was however still credited for the unused song in the show's opening titles. ^ "Adele named as UK's richest female musician ever as fortune hits £85m". BBC. 24 April 2016. ^ a b "Lloyd-Webber, Baron, (Andrew Lloyd Webber) (born 22 March 1948)". Who's Who. 2007. doi:10.1093/ww/9780199540884.013.24803. ^ "Andrew Lloyd Webber profile". BBC. Retrieved 18 February 2012. ^ a b Citron, Stephen (2001). Sondheim and Lloyd-Webber: the new musical. Oxford University Press. ISBN 9780195357271. ^ "Kennedy Center Honors Pictures". Cbsnews.com. Retrieved 27 September 2014. ^ "Explore the Arts – The John F. Kennedy Center for the Performing Arts". The John F. Kennedy Center for the Performing Arts. Archived from the original on 3 November 2014. Retrieved 27 September 2014. ^ Barratt, Nick (7 July 2007). "Family detective". The Daily Telegraph. ^ a b c d e Chandler, David (2012). "'Everyone should have the opportunity': Alan Doggett and the modern British musical". Studies in Musical Theatre. 6 (3): 275–289. doi:10.1386/smt.6.3.275_1. ^ a b c Ellis, Samantha. "Joseph, London, February 1973". The Guardian. 24 September 2003. ^ Gordon, Robert; Jubin, Olaf (21 November 2016). "The Oxford Handbook of the British Musical". Oxford University Press – via Google Books. ^ Show People with Paul Wontorek Interview: Broadway Icon Patti LuPone on YouTube 16:36–17:12. ^ "Lloyd Webber, Andrew: Inspired By Sunset Boulevard Really Useful Group". Archived from the original on 18 September 2008. Retrieved 11 June 2009. ^ "WashingtonPost.com: Lloyd Webber, Superstar". www.washingtonpost.com. ^ "How Do You Solve A Problem Like Maria?, Panel Chosen". Bbc.co.uk. Retrieved 27 September 2014. ^ "Cat Destroys Lloyd Webber's Phantom Sequel Score | Playbill". Playbill. Retrieved 11 December 2016. ^ "American Idol Tracker: What's new, Andrew Lloyd Webber?". Latimesblogs.latimes.com. 18 April 2008. Retrieved 27 September 2014. ^ Nikkhah, Roya (31 January 2009). "No more nul points at Eurovision?". The Daily Telegraph. London. Archived from the original on 3 February 2009. Retrieved 31 January 2009. ^ Midgley, Neil (11 September 2009). "Andrew Lloyd Webber to audition dogs for The Wizard of Oz's Toto". The Daily Telegraph. UK. Retrieved 3 January 2010. ^ "Jesus Christ Superstar Arena Tour". Archived from the original on 20 May 2012. ^ "Profumo musical set for West End". belfasttelegraph.co.uk. The Belfast Telegraph. 28 June 2013. Retrieved 28 June 2013. ^ Matt Trueman. "Andrew Lloyd Webber to stage School of Rock | Culture". theguardian.com. Retrieved 26 August 2014. ^ "An Exciting Announcement!". SchoolofRock.com. Retrieved 20 January 2015. We, here at School of Rock, are so proud and excited to announce that we are now partnered with School of Rock the Musical. Andrew Lloyd Webber and his team have expressed an enthusiastic interest in having School of Rock kids audition for roles in the show! ^ "Audition for a Role in School of Rock". Archived from the original on 12 January 2015. Retrieved 20 January 2015. We are holding band tryouts for rock stars ages 9-15, male and female, who are great singers and actors. We're also looking for talented kids who play drums, bass guitar, guitar, and piano/keyboard. Show us your kid's chops and he or she could be on Broadway! ^ Joshua Barone (5 March 2018). "5 Things We Learned From Andrew Lloyd Webber's New Memoir". The New York Times. Retrieved 7 March 2018. ^ a b Moutby, Adrian (9 January 2004). "The high-brow just don't know how to love him". Times Higher Education. Retrieved 29 March 2012. ^ "Lloyd Webber wins Phantom battle". News.bbc.co.uk. 16 December 1998. Retrieved 27 September 2014. ^ "Who the hell does Roger Waters think he is?". Q Magazine. November 1992. Archived from the original on 5 December 1998. Retrieved 20 November 2009. ^ Ouzounian, Richard (2 January 2006). "Aspects of Andrew". Toronto Star – via EBSCOHost Research Database. ^ "Rich List 2007". Sunday Times. London. Retrieved 2 October 2008. ^ "Andrew Lloyd Webber Auctions Art For Charity". Bloomberg.com. 17 March 2010. Retrieved 27 September 2014. ^ "Picasso's Angel Fernandez de Soto withdrawn from Christie's sale". The Art Wolf. Archived from the original on 23 March 2010. Retrieved 18 March 2010. ^ "Lloyd Webber's Picasso to be sold after Nazi row settled". Agence France-Presse. 17 March 2010. Retrieved 18 March 2010. ^ "Picasso reaches £34.7m in Christie's auction". BBC News. 24 June 2010. Archived from the original on 26 June 2010. Retrieved 26 June 2010. ^ a b "No. 54689". The London Gazette. 25 February 1997. p. 2341. ^ "Voting Record — Lord Lloyd-Webber (13305) — The Public Whip". www.publicwhip.org.uk. ^ "'Take that look off your face', Mr Blair told". Conservative Party. 13 April 2005. Archived from the original on 4 July 2007. ^ "Celebrities' open letter to Scotland – full text and list of signatories". The Guardian. 7 August 2014. Retrieved 26 August 2014. ^ Deacon, Michael. "George Osborne, tax credits... and the quiet revenge of the Lords". Daily Telegraph. Retrieved 27 October 2015. ^ Troup Buchanan, Rose. "'Desperate' Tories flew in peer Andrew Lloyd Webber from New York to prop up government vote on tax credits". The Independent. Retrieved 28 October 2015. ^ Elgot, Jessica (16 October 2017). "Andrew Lloyd Webber quits as Conservative peer". The Guardian. Retrieved 17 October 2017. ^ "Lloyd Webber treated for cancer". BBC News. 25 October 2009. Archived from the original on 26 October 2009. Retrieved 25 October 2009. ^ "Andrew Lloyd Webber gets cancer 'all clear'". News.bbc.co.uk. 11 January 2010. Retrieved 27 September 2014. ^ ""Trouble down below" by Philip Hodson, The Independent". The Independent. London. 6 May 2014. Retrieved 27 September 2014. ^ "No. 52952". The London Gazette (Supplement). 12 June 1992. p. 2. ^ a b c "Awards – Andrew Lloyd Webber". Andrewlloydwebber.com. Archived from the original on 10 October 2014. Retrieved 27 September 2014. ^ "Playbill.com". Playbill.com. Retrieved 27 September 2014. Wikimedia Commons has media related to Andrew Lloyd Webber.